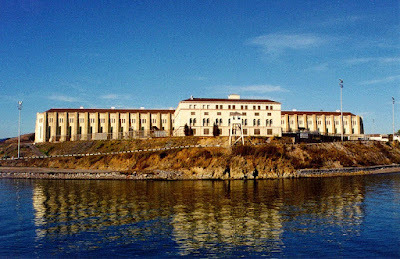 Among the various initiatives of the recently rejuvenated Benedict XVI Institute for Sacred Music and Divine Worship, which is under the patronage of His Excellency Archbishop Cordileone and the Archdiocese of San Francisco, the Latin Mass is to return to San Quentin State Prison, with the first Mass scheduled for August 25th. The Institute runs its own schola, which is a teaching choir that can visit parishes and communities in order to enable them to chant the Mass. Archbishop Cordileone recently visited the prison with the schola for an evening of musical meditation and prayers, and proposed this idea to the prisoners who attended. The response was enthusiastic and gratifying. I have just come back from an extraordinary evening with some extraordinary news for you: The Latin Mass is coming back to San Quentin for the first time in three generations! First, to give men forgotten by many in society the uplifting experience of pure Sacred Beauty—with music performed by four very talented professional singers. Second, to teach these men they can chant too; just hearing these men chant the Litany of the Saints together was inspiring! Our Benedict XVI Institute Schola and Teaching Choir is not just a performing choir: we aim to show ordinary Catholics they can participate in the Mass in this special way. So our third and most important goal last night was to invite the men at San Quentin to form a schola that will help bring back the Traditional Latin Mass on August 25. And guess what? Twenty-five men said yes! Prison is a kind of community and like any community, there are some who actively work to make it better. We met a lot of men like that last night. Dwight, the sound guy, introduced himself and started asking about how we want to be miked for the Latin Mass. “Bobby”, an old hand, told me he used to sing the Latin Mass at St Peter’s in the Mission district [of San Francisco] with the “Christian brothers.” (What a gorgeous old San Francisco church I would love to do a chant camp there! Take a look!) “Sam” who sat behind me, was a Protestant curious what this new music sounded like. He’s only been in San Quentin for two weeks “but the church scene is popping!” he told me. Then the music started. Rebekah Wu, our talented music director, organized the music around the “Six Seasons” of the liturgical year. We began with Frank La Rocca’s Ave Maria (and come to think of it also ended with Hail Holy Queen). 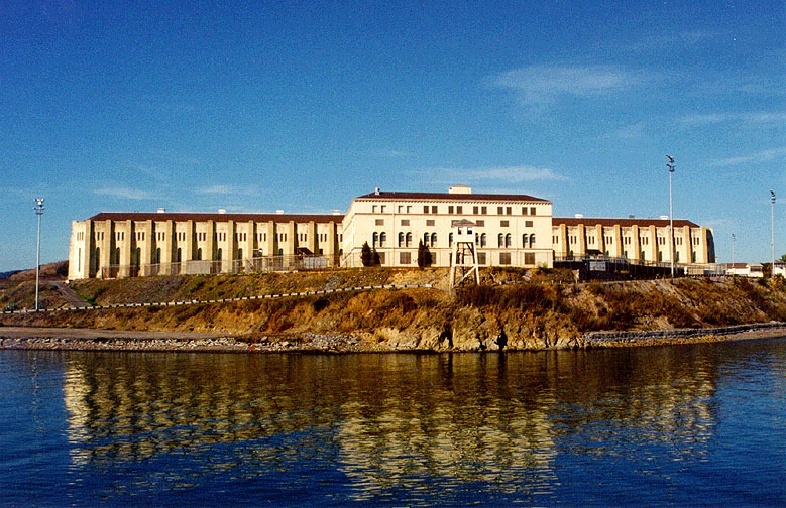 Starting in Advent season, the choir mesmerized 60 or so San Quentin prisoners with a mix of Gregorian chant (“Creator Alme Siderum,” “Resonet in Laudibus,” “Attende Domine,” and sacred polyphony old and new (Bruckner’s “Vexilla Regis,” Jean Berger’s “The Eyes of All,” the lovely Christmas carol “I wonder as I wander,” and during the Easter Tridium “Jesus so Lowly”). During the deep Lenten season, Rebekah gave testimony to God’s healing power in her own life, mentioning the good thief who ended up in paradise with Jesus. Father George interrupted to say a few words: pointing to a huge painting hung on the wall he explained. “That is Saint Dismas,” Fr. George told us. “The good thief who repented and whom Jesus saved. That painting was gifted to us by a death row inmate who died last year, Fernando Caro.” Out of evil, God can rescue beauty and give hope, if we let him. Then it was time to bring the men into chant with the choir. Rebekah taught us all to sing the Alleluia as the chorus of “O Filii et Filiae,” and then had the men chant The Jesus Prayer: Lord Jesus, Son of God, have mercy on me, a sinner. “Now it’s your turn to sing,” she said to the men. (“Do you really want to record this?” a man in front of me quipped.) Then as I described came the Litany of the Saints, as well as an invitation to form a schola. Not only do we have 25 enthusiastic volunteers, all the men I spoke with, whether they joined the schola or not, are anxious to come and attend the Latin Mass on the 25th of August. For some it will be a trip down memory lane to the music of their Catholic boyhoods. But for many of the young men present, it is a fresh chance to participate in the ancient rituals of the Church, to share the noble sacred beauty that is their heritage too. "One young man told me that he felt the Holy Spirit buzzing in his soul while he joined the choir in some chanting during the concert. I was especially delighted to see that so many men want to learn Gregorian chant and classical sacred choral music, and help bring the Latin Mass to San Quentin,” said Rebekah Wu who directs the Benedict XVI Institute Schola and Teaching Choir. "I saw these men, who humanly speaking are in a dire situation that may seem hopeless, be lifted up to God by sacred beauty and given new hope," Archbishop Cordileone told me afterward. Thank you Archbishop Cordileone--and all the supporters the Benedict XVI Institute for Sacred Music and Divine Worship who’ve helped make this possible: with your prayers, with your financial support, with your words of encouragement. People who are interested in supporting the San Quentin schola can follow the link here. And for those in the San Francisco Bay area who would like to bring the Benedict XVI Institute Schola and Teaching Choir to your parish (they offer children, teen, and young adult chant programs), email Rose Marie at wongr@sfarch.org.